When Swarovski re-designed their SLC and EL binoculars, we knew it wouldn't be long before they overhauled their spotting scopes. Well, they're here, and they go way beyond what we expected! These scopes are so innovative they instantly redefine what the term “spotting scope” means; they are more versatile than a scope has ever been before. The key concept is modular design. These scopes are comprised of separate ocular and objective modules which can then be mixed and matched. This replaces the body and eyepiece design favored by all other manufacturers. There are specific advantages to the modular approach. The biggest plus is that you can purchase more than one objective module for use in different circumstances. In effect, you no longer need to choose between a small, compact travel scope and a larger brighter main scope. You just purchase both objective modules and use the one that suits you for any given purpose. The ocular modules perform identically, so, even though we reviewed an angled version, you should know that anything we say of one is true about both. The objective modules come in 65-, 85- and 95-mm sizes. Like the ocular modules, all are fully sealed and nitrogen-purged. That means that assembling or disassembling the scopes in the field is more worry-free because blowing dust and grit can't get into the internal portions of the optic. All focusing is achieved with a broad (more than 2 inches wide) helical focus ring. Due to the fact that the focus ring and zoom ring are mounted so close together, there is the possibility that you will confuse them. To prevent this, Swarovski put densely packed ridges on the focus ring and more widely separated ridges on the zoom ring so that there is an obvious tactile distinction between them, so you know which one you're on without actually looking. Each objective module has a tripod mounting foot, and a small knob on the ring that the foot is attached to allows for rotation of the objective barrel within the ring, like any normal scope. One nuance of these modules that we really liked was that when rotating the objective module in the ring, there are very nice, obvious detents for the vertical and the 45° and 90° positions on each side. This means that when you are through using it, returning the scope to exactly vertical is trivial, a convenient feature. All three objective sizes have fully functional, extendable lens hoods. One nice little wrinkle to these is that the objective lens cover attaches to the hood, regardless of whether it is extended or not (most lens caps only work when the hood is collapsed because they actually attach to the inner rim of the lens itself. Swarovski spotting scopes have always had a foot design that let the user mount the scope into compatible tripod heads without using a quick release plate. Originally, these feet were compatible with Manfrotto heads that accepted their RC2 plates as well as the Swarovski head such as the DH-101. Swarovski has recently introduced their PTH (Professional Tripod Head), which is a gimballed head that uses an Arca Swiss mount. To continue allowing attachment without a quick release plate, Swarovski converted all their spotting scopes to Arca Swiss feet. In doing this, Swarovski solved one of the only things we found that we didn't like about the original X-series scopes - that the tripod mounting foot did not have a hole for a stabilizing pin from the quick-release plate of most standard tripod heads. The ocular modules are designated ATX (angled), STX (straight), and BTX (binocular). To switch objective modules, you simply press a button that is recessed into the lower left side of the ocular module and twist the module counter-clockwise until it can be pulled free. Mounting the new module is the reverse of this: line up the module and twist it in a clockwise direction until it clicks, indicating it is locked – you don't need to press the button to mount a module. All ocular modules are sealed and nitrogen-purged to be completely waterproof and fogproof. The ATX and STX are 25-60x zoom eyepieces when on the 65- and 85-mm objective modules, and 30-70x on the 95-mm objective. The zoom function is in a 1-inch wide twisting ring on the ocular module, located close to the junction with the objective module. This puts it right next to the helical focus ring on the objective module, to allow for one-handed operation of the two. A raised triangle in the rubber armoring of the zoom control ring lines up with indications of magnification that are actually on the objective module (25x, 30x etc). Each features a twist-out eyecup to adjust to the viewer's preference, and a tethered soft rubber ocular lens cap. The zoom ocular lens cap is tethered to the module with a bungee-like cord that is easily removed if you wish but is otherwise there when you need it. The BTX is fixed power: 30x on the 65- and 85mm objectives and 35x on the 95mm. It only comes in an angled version. The BTX is intended for comfort during long-term viewing, affording the opportunity to keep both eyes open all the time while viewing. This is a great tool for hawk watching, whale watching, or scanning for game across a valley. As with any binocular, it has adjustments for interpupillary distance, twist-up eyecups with detents, and a diopter adjustment for balancing the right eye focus to the left. Since there is only one objective lens attached while viewing, there is only minimal 3-D perception. This does get more pronounced with increasing objective size. The incoming light is split in two by the BTX, so only half of it gets to each eye, but because you are viewing with both eyes the same amount of information gets to your brain. A couple of interesting features have been added to the BTX. The most apparent is the forehead rest - a curved piece of plastic with a dense foam rubber cushion. A geared shaft connects it to the main body of the BTX and a knurled wheel lets you adjust the position to suit your comfort. The other feature is a sighting device which takes a bit of understanding. While most scope sights are hollow tubes that let you see your target, this one has a starburst pattern at the forward end. You use it with both eyes open – sighting your target with your left eye while centering the starburst pattern with your right. When the pattern is centered, the target should be in view in the eyepieces. As with any telextender, light transmission is reduced by the square of the magnification, so the ME 1.7x reduces the effective aperture by about 1.5 f/stops. If you have enough light, that is not a problem. Theoretically, because the mounts are all the same, you could stack two or more extenders, trading light for magnification. Having summarized the traits of the individual modules, we can now get to the stuff that really matters: how well they work? We could save ourselves a lot of bother and simply say they work stupendously well, but you probably want details, don't you? How do you put something like that into words? The scope is brilliant, the view is incredibly high-contrast, the details revealed are stunning. But until you see it, you can't really even imagine it. We've been doing this kind of stuff for a long time, and this is easily one of the best we've ever played with. One of the things we routinely use scopes for here is a sea-watch. We take the scope to a place with a bit of height and a panoramic ocean view. Those conditions – when the view extends for miles straight out – require maximum clarity and resolution from the optics, and very few scopes actually deliver a satisfying performance when pushed that hard. The new Swarovski is one of only three scopes we've ever used this way to deliver really satisfying views. That's saying a lot. The other way you might measure the performance of the scope that you can share is by photography. We'll cover this in greater depth in the digiscoping section, but suffice it to say that digiscoping is where the maxim of “Garbage in – garbage out” really holds true. It takes great optics to deliver excellent pictures, and as you'll see, the ATX/STX scopes do exactly that. The table below summarizes a few physical and optical properties of these scopes, specifically dealing with how the three objective modules differ from one another in these properties. Weight 3 lb., 12.2 oz. 4 lb., 8.1 oz. 5 lb., 0.3 oz. As might be expected, size and weight both increase with the larger objective lens sizes, as only stands to reason. Eye relief is a function of the ocular module, so it doesn't vary as those are equivalent, but it's worth noting that 20 mm is more than enough eye relief for any user. The eyecup extends with a counter-clockwise twist for users who do not wear glasses. The eyecup mechanism has nice resistance to it so it is fairly stable even in intermediate positions. The close focus statistic is interesting. Most people purchase a scope to provide better magnification and detail on things that are far away, which begs the question: why do we care about how close it focuses? The answer to that is: photography. All three of these objective modules are fantastic for photography, and being able to focus sharply on something closer in can deliver some startlingly beautiful images. Field of view is inversely proportional to magnification, so a higher magnification, in this case the 30x of the 95-mm objective versus the 25x on the other two, means that the 95 has a smaller field of view. That's just how it is. As with all Swarovski scopes that we know of, the ATX/STX scopes use a helical focusing ring on the objective module, rather than a dual or single focus knob elsewhere. Helical versus knob focus is something that a lot of folks feel strongly about, but we really don't. As far as we're concerned, the issues are: does it work, and can you easily get sharp, clear focus without a lot of fuss? The answers, with respect to the modular scopes are: yes and yes. The focusing ring turns quite smoothly and easily without shaking the scope to any major degree. Getting from the minimum close focus out to infinity takes 2.9 complete turns of the ring, which is quite a bit less than some of the smaller knobs used on other scopes. The focus is nicely ‘pitched' which means that when you are zeroing in on that point of absolute crispness, you don't just blow by it. In fact, you can ease right up to it with excellent precision. There's actually a lot to like about this focus mechanism. One place where the Swarovski modular scopes exceed all other scopes currently on the market is in terms of digiscoping. Swarovski initially went to great lengths to optimize their digiscoping adaptors for point-and-shoot (PAS) and DSLR cameras, and for the most part, they really did it right. At this point, no other scope manufacturer on the market has adaptors that work as well as these. As the camera market has changed, pocket-sized PAS cameras have fallen out of favor and are being replaced by cameras in smart phones. Swarovski has kept up with the market, dumped their PAS adapter, and replaced it with a series of phone adapters. For DSLRs, the TLS APO is the adapter of choice. They come in three different focal lengths and two different mounting systems. There is one mounting system based on the ATX/STX oculars and one for the ATS/STS/ATM/STM spotting scopes. For this review, we will concentrate on the ATX/STX versions. There is no way to connect a DSLR to a BTX. TLS APOs come with three pieces. They are an adapter sleeve, the adapter shell with a built-in lens, and a replacement eyecup. The adapter sleeve for this series is called a DRX sleeve. It slides over the ocular and a little key inside slides into a slot in the ocular housing to position the sleeve and keep it secure. The original eyecup is removed from the ocular and replaced with the one that comes with the TLS. This eyecup has a flange that keeps the sleeve from sliding off the ocular. The main part of the TLS APO is a bell-shaped affair that has a fixed focus lens inside, so you are required to focus using the scope. The lens comes in one of three focal lengths: 23mm for micro 4/3 cameras, 30mm for APS/APS-C cameras, and 43mm for full-frame cameras. There is one more piece required to connect to the camera, which is a T-2 adapter designed for the specific camera. Swarovski T-2 adapters are available for Canon EOS, Nikon F, Sony E-mount, and micro 4/3. If you have a different camera, T-2 adapters can be found from third-party sources. However, if you have a camera that matches what is available from Swarovski, we highly recommend the Swarovski adapter as they are machined to have the camera horizontal when the fastening screw is at 9 o’clock when placed on the ocular. In practice, the TLS APO is one of the smoothest-working adapters we have used. 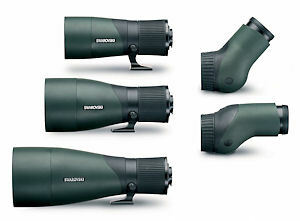 Take a look at our gallery of photography with the Swarovski ATX/STX digiscoping systems (here). For smart phones, Swarovski started out offering adapters designed for specific iPhones, which unfortunately did not include any of the larger iPhones, and completely left out all other brands. In addition, people started demanding a universal adapter rather than pay for a new adapter with every phone upgrade. Swarovski listened and in 2018, they introduced the VPA (Variable Phone Adapter) and new adapter rings to fit ATX/STX scope eyepieces, ATS/STS/ATM/STM scope eyepieces, and binocular and BTX eyepieces. The VPA has adjustments for height, width, and camera location variable enough to fit virtually all smart phones. The only peripherals available for ATX/STX scopes that we haven't previously discussed are the cases. Swarovski makes specific cases for each individual module (so there are 5 in all) that are designed to be view-through, meaning you can look through the scope while the case is on. In fact, the 65-mm model is so small when broken apart that it actually fits in the carrying case for the 50-mm Swarovision binocular. That's how they brought it to show us, and we were completely fooled by it! This has obvious utility when you want to travel light. Our final assessment of the Swarovski ATX/STX modular scopes is that they are some of the very highest quality spotting scopes available today. And if you are a digiscoping enthusiast, they are pretty much the only scopes you should consider. Inevitably, this leads to the question of cost. For simplicity's sake, all costs of the scope modules and peripherals are in the table below. This is the very high end of the spotting scope market. But if you want to talk about performance, this is also the very deep end of the market, and there is nothing else like these scopes to compare them to. We are already seeing a lot of these in the field, a trend that will only get stronger with time.